Tea bowl with enamelled blue and gilt decoration, Jiaqing c 1800. 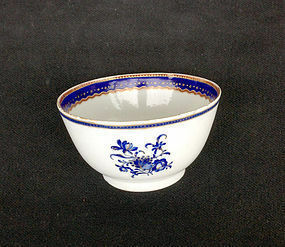 The blue inside border with small stars in gilt makes it probable that the bowl was intended for the American market. Height: 2" / 5 cm, diam: 3 1/2" / 9 cm. Condition: rim frits.